At the moment the expedition team is somewhere near the town of Pudoszh on the east side of lake Onega, preparing for the ship launch, scheduled monday. I’m traveling with some friends to St. Petersburg and plan to catch a train to Petrozavodsk during the weekend, and then a boat from there to carry me across the lake. 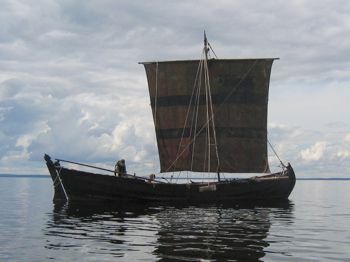 Most of the Shnjaka crew is Russian, but participating in the expedition is also Fredrik Koivusalo, the captain of the Finnish viking ship replica Heimlösa Rus. 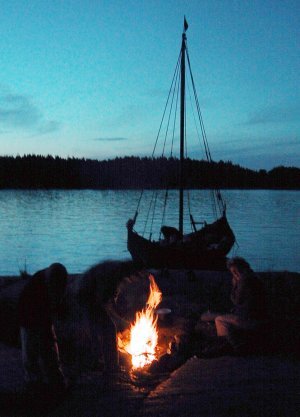 I participated to the 2001 expedition of the ship from Vyborg, Russia to Loviisa, Finland. The accompanying photo is from that trip. After the hard work leading to the OpenPSA 2 preview, I’m really happy to get to do something not at all related to computers. While there are still challenges facing me joining the expedition, it should turn out to be a fine adventure. 2005-06-24 05:56Z: We’re leaving for the border soon. Unfortunately the SMS gateway seems to be unable to receive messages so I won’t be able to update this log until it is fixed. I’ll try to instruct Topi to fix the GW as soon as I get some ideas from Rambo on what is wrong. 2005-06-25 08:40Z: The day ended with beer in a park and midsummer fireworks over Neva. Now we’re sitting in Sveta’s bike shop, waiting for my train. 2005-06-25 16:55Z: Syväri. The Murmansk train brings the luxuries of trains like Repin into a new light. Sweating in my small cot I watch Carelia swoop by. 2005-06-25 20:12Z: Saturday night on the beach bulevard of Petrozavodsk looks like Finnish vappu. Air is filled with mosquitoes and smoke from shashlik stalls. 2005-06-26 03:50Z: Sun peeks behind the clouds. I got tickets for KOMETA-11 to Shala. I hope I can buy breakfast from there as here everything is closed. 2005-06-26 04:30Z: This will be the last message in a while, as apparently there is no cell coverage in east of Ääninen. I’ll try to post updates later. 2005-06-26 07:25Z: Arrived to town of Pudozh after bumpy ferry trip and even bumpier bus ride. I’ve now hired a lada to take me to Kuganovolok and the ship. 2005-06-27 10:25Z: We fetched the ship from Lake Vodla National Park in police convoy. It’ll be launched in Kashino and then we’ll set out to Lake Onega.